Proceeds from the sale of these cards will benefit West African women and their NGOs, artisans, authors, and publishers, and will facilitate the marketing of their works. This West African Sahel Blanket Series of greeting cards is one of the first produced by Mother Tongue Editions to honor and celebrate the work of African artisans. 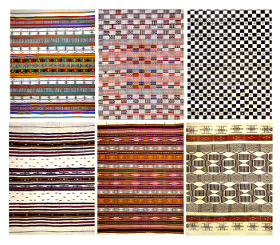 These cards capture hand woven blankets from Mali and Niger, in cotton, wool, and combined cotton and wool. 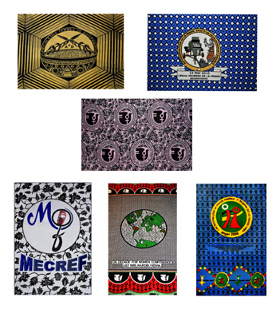 This set of greeting cards shows 6 different African pagnes of cloth made to honor women and their organizations in Africa. These have been purchased in Africa from the 1970s to the 2000s. 5 of them are from the Republic of Niger and represent either women's organizations or celebrations. The 6th commemorates a UN Decade for Women Conference held in Nairobi, Kenya in 1985. 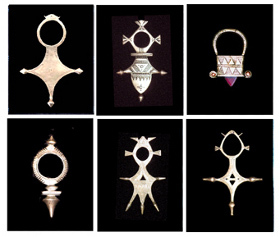 This set of greeting cards shows handwrought silver Touareg crosses made by Touareg silversmiths in the Republic of Niger during the 1970s. The Touareg people are traditionally nomadic camelback trans-Saharan transporters of salt, potash, and other products of the desert. Each major Touareg town has its own symbol, each one often resembling a cross, and thus the label cross has been given to these symbols by outsiders. 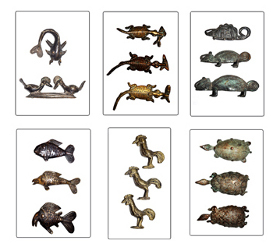 This set of greeting cards shows handmade bronze cast figures of various animals. The figures come from several West African countries, particularly from the Republic of Mali and the Republic of Niger. Chamelons, crocodiles, fish, birds and turtles figure prominently in among these hand cast figures by smiths using the lost wax casting method. 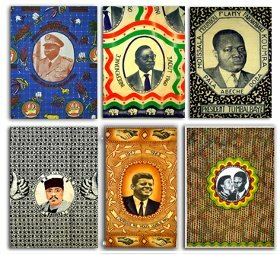 These cards show commemorative printed textiles produced in West Africa to honor various African heads of state. One of the textiles from the Republic of Niger honors the late President John F. Kennedy. The U.S. Postal Service no longer offers reduced postal rates for books and documents when being mailed internationally. Therefore, there is no longer either a "Book Rate", nor a "Media Mail Rate", For this reason, Mother Tongue Editions is obliged to increase its postage rates for international mailing. Thank you for your understanding. Mother Tongue Editions is a not-for-profit organization devoted to the promotion of writing and publishing in African languages.